Tiny Montenegro may be less visited than its neighbor Croatia, but with 180 miles of coastline, pristine lakes, snow-capped mountains and medieval villages it’s poised to become the next hot destination in the Adriatic. (Montenegro, the smallest country in what was once Yugoslavia gained its independence from Serbia in 2006.) We started our journey in Dubrovnik, crossing the border to a disappointing stretch of unattractive Soviet-style developments before arriving at the coast and endless stretches of sand and surf. Our destination: The Aman Stevi Stefan, located just south of Budva, is the first luxury hotel on the Montenegrin coast. We won’t forget our first sighting of Stevi Stefan, an entire village jutting out into the Adriatic. Though on the path of well-heeled travelers the Aman and Montenegro are still under the radar, go now, before everyone else catches on. We worked with Calvados Club, the leading travel company for luxury & experiential travel in Croatia and the whole West Balkan region including Slovenia, Croatia, Serbia, Bosnia and Herzegovina, Macedonia, Kosovo, and Albania. All of our guides and drivers were top notch, and Calvados can arrange individual experiences throughout your trip. Aman Stevi Stefan is most easily reached from Tivat Airport, though more international flights fly in and out of Podgorica and Dubrovnik airports. 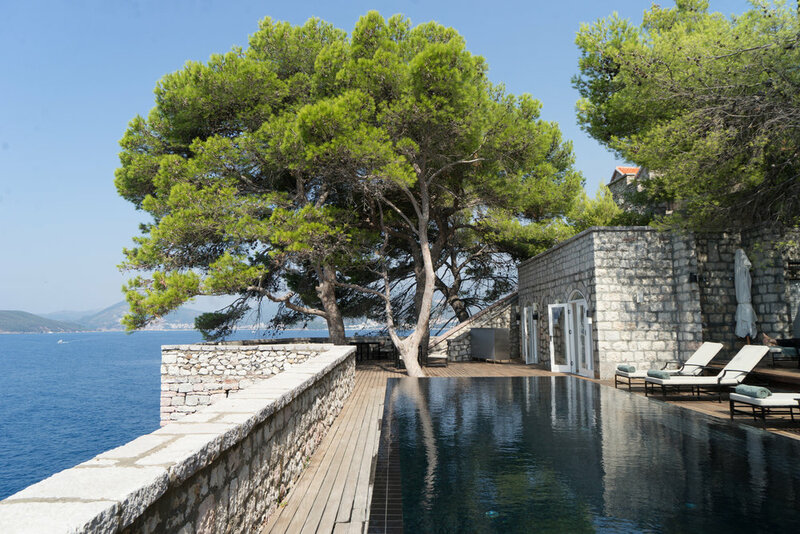 Most guests combine their trip with a stay in Dubrovnik approximately a 2-hour drive, though border crossings can add considerable time to your journey during the busy summer months. Though not part of the European Union, as of yet, the currency in Montenegro is the Euro. Stay: Talk about a unique stay. Picturesquely set on a small island attached to land by a narrow isthmus the entire hotel was once a 15th century fishing village. Cobblestoned narrow lanes connect the 600-year-old red roof cottages, once the homes of Montenegrin fishermen. (You will get lost finding your room for the first day or two.) All 50 rooms have been restored simply, yet luxuriously. Drop-dead vistas are pretty much guaranteed wherever you turn. If you’re not inclined to walk, Aman’s small speedboat will shuttle you to the mainland’s three pink sand beaches and their sister property Villa Milocer. On the island are two pools, a signature restaurant and an outdoor dining piazza resembling a village square—not a bad spot for a morning meal. And in case you’re feeling religious there's not just one but four small churches on the island. Pool Hang: Lounging at the dramatic black tiled adult pool you’ll feel like you’re on the deck of a cruise ship far out at sea. It’s perfect for an early morning or late day hang, or if you’re too lazy to venture off the island over to Queens beach. The family-friendly heated pool, half indoors, half outdoors is just below the Aman restaurant and not nearly as special. Beach Time: We chose mostly to spend our days on Queens beach, the prettiest of the beaches in Stevi Stefan and the most private, available only to hotel guests. (The beach at Villa Milocer is also only for hotel guests, but the public is welcome to stroll the promenade and surrounding gardens—the other two beaches are public.) Queens beach is set in a secluded cove, perfect for swimming. To have a beach, and one this beautiful, basically to oneself during the busy summer season is a treat in and a perk of staying at the Aman. Dine Like a Royal: At Villa Milocer, the mainland villa, once the summer residence of the Queen of Yugoslavia. There are rooms here as well, but we think staying on the island is more unique, but do come for dinner and watch the sunset over Stevi Stefan as you dine on the outdoor terrace. Spa: We had read a lot about the spa, said to be one of Europe’s largest, but sadly it left us lukewarm. There’s no denying the indoor pool is dazzling and impressive, but the spa itself lacked personality and felt cold, out of place with the surroundings. Our treatments were good, not great and we were sorry we had left the beach during the late afternoon sun. The Happiest Hour: Plan your shower so you can arrive at Rakija Bar before sunset. The large open cocktail bar attached to the Aman signature restaurant serves up killer views alongside delicious drinks, and the sunset is grab-your-camera "ooh" and "aah" spectacular. Meander to your dinner table following sun splash and enjoy the lingering colors of the sky while you dine on Mediterranean food with a heavy Italian accent. Favorite Meal: Don’t miss lunch or dinner by the sea at Langust, a 10-minute walk from Queens Beach in the fishing village of Przno. (The hotel will drive you there as well) Watch the families, mostly Eastern Europeans, swimming in the sea as you enjoy fried calamari, shrimps bouzzara, grilled sea bass or perhaps some seafood risotto washed down with a local wine. The food at the Aman is good, but its fun to experience something more local. We also heard Demizana, just outside of Budva, is excellent, known for destination-worthy seafood. (It’s about a 20-minute drive.) There’s a Nobu on the mainland across from the hotel, which we did not try. The Aman also recommends Casa Mia in Rezevici with wonderful views of the coast. Day Trip: Picture a Norwegian fjords meets Lake Como, then add ancient Turkish and Greek settlements plus UNESCO World Heritage sites and you have the curving Bay of Kotor. Mountains dip into the sea, and small churches dot the landscape—it’s that pretty! One friend told us he cried upon sailing into the Bay of Kotor, moved by the overwhelming beauty of the bay. That or he had too much sun and rose. Spend some time in the historic old town of Kotor, walled in by the Venetians centuries ago and surrounded by dramatic rock walls. Visit the Cathedral of St. Trifun and the Maritime Museum. Kotor was so strategically important that the Venetians built daunting defensive cliffs around the city, it’s worth allowing time to hike this amazing engineering feat, rewarded with incredible vistas. Hungry? The best restaurant in town is Galion, overlooking the bay and the city walls. A 20-minute drive brings you to Perast, an ornate Baroque town, pretty as a postcard overlooking a pair of small islets—St. George and Our Lady of the Rock. Many of the buildings date form the 17th and 18th century, once grand residences of navy captains. Take a taxi boat to Our Lady of the Rock. If you didn’t eat earlier, grab a waterside seat at Conte’s with beautiful views of the Verige Strait and the two islands. Nearby Activities: If you can pull yourself away from the Aman there are many worthwhile excursions all about a one-hour drive. Head north to Skagar lake , take a boat cruise amidst stunning scenery stopping for a wine tasting and lunch. Active types can bike or hike the Steep trails in Lovcen National Park with stunning views over Boka Bay. The park is the final resting site of Petar II Petrović-Njegoš, the 19th-century poet and statesman; visit his magnificent mausoleum on the top of Mount Lovcen. After visit Cetinje, the former royal capital dating back to the 15th century, wander the tree-lined boulevards dotted with museums and galleries. 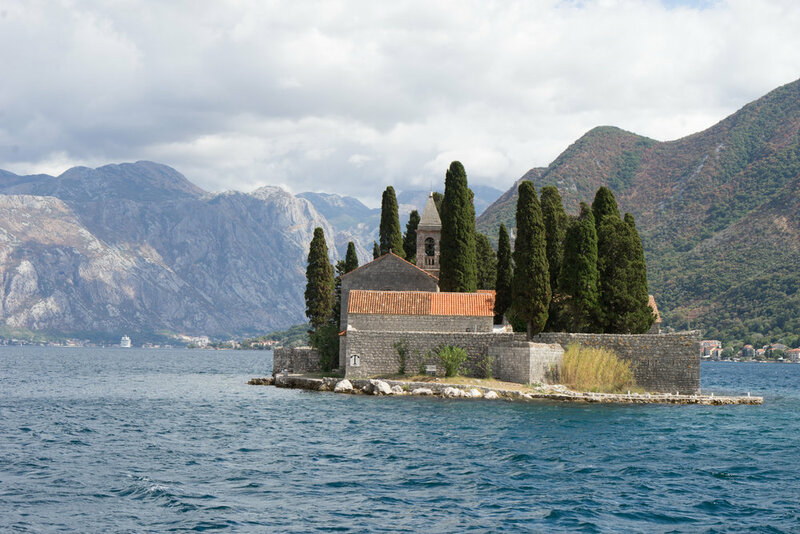 Take to the seas and charter a boat to cruise Montenegro’s coast dotted with medieval towns. Skip: Budva is the country’s most visited destination, attracting tons of partyers. More than once we were told to skip a visit thanks to Russian style buildings that read more comrade than charming and a nightlife that’s often dubbed “The Miami of Montenegro”. If you go make sure to visit the Old Town, meant to be quite lovely. Love to Return: There’s more to the country than just the coast. We’d love to spend time in Durmitor National Park and visit the Tara Gorge-Europe’s Grand Canyon-78km long and 1,300m deep.